We downsized almost five years ago from a huge house with a big kitchen to a smaller house with a horrible, tiny kitchen, but now I have my dream kitchen, at last. So thrilled. The first year here, we got planning for a large extension, but when I first became poorly, the hospital told me to cancel it for a while. Two years later, I had the “All Clear” from the hospital, but by then our ideas had changed. We had watched the seasons change, realised where the sunrise and sunsets were in relation to the house, and how we wanted to use the garden. And so we planned a new extension, right across the back of our little house, facing south into the garden. 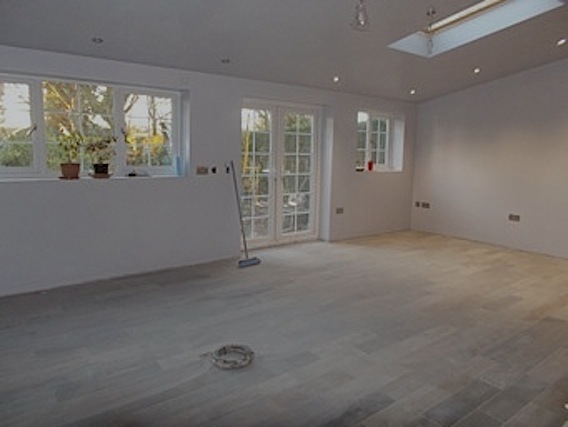 This fabulous new room was completed just before Christmas 2015, but we had to wait almost a year to save up and finalise the design for our new kitchen. Only now have I managed to put together the pictures and story of how my dream kitchen came about. Being a builder’s daughter, I grew up with new house plans being spread across the dining table after tea, as my father was excited whenever he received his new plans. From an early age, these fascinated me, and whenever I finished my school exams early, I would turn over the exam paper and design either house plans or show-jumping courses. This stood me in good stead, and I have been lucky enough to have always planned my own kitchen. 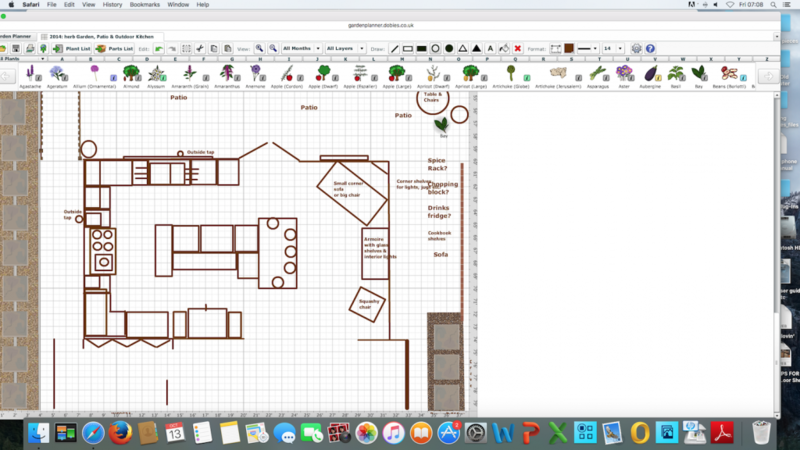 This time, believe it or not, I used the ‘Garden planner’ from Dobies! Yes, that is correct. I planned my Kitchen Garden with it, then suddenly realised that I could utilise it for planning my Kitchen. And it absolutely worked. Being honest, I had been planning this kitchen for about 3 years. So this is the actual finished result above, except there were more details on the final plan given to the kitchen company, but it had dramatically changed from the first attempt. 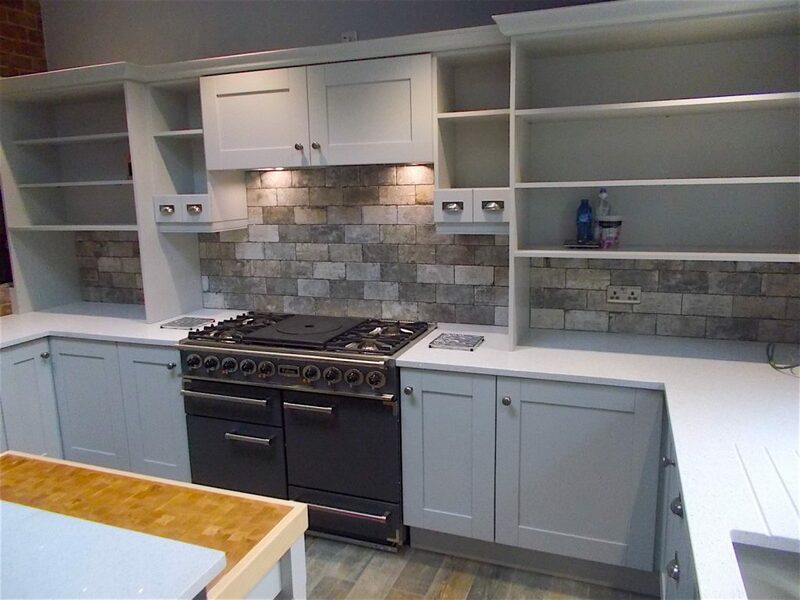 I spent about a year searching for the best fitted kitchen company that suited our way of doing things – some were too expensive, some looked shoddy, some didn’t have the type if units we wanted. But our brilliant electrician, Tim, kept saying why didn’t I look at a company he sometimes worked with. 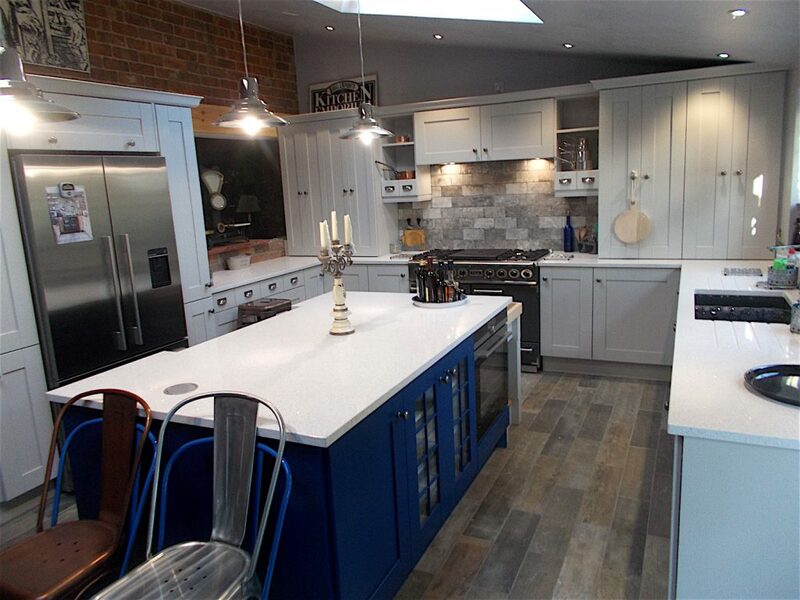 In the end, because we trusted Tim implicity, we rang up Michael O’Malley, who owned Kingston Kitchen & Bedroom Company, 56-60 Alfred Street, Hull, HU3 2DF, ( Tel: 01482 322966 ), to arrange to visit the showroom. Once there, and meeting Mike, we realised we had found the company for us. We had our amazing big room for a year, without it being a kitchen. Recycling loads of our old furniture from our Hessle house, furniture which was very dusty and cobwebby as it all had been stored in the garage and various grubby places, we played like big kids in a dolls house, moving things around, just enjoying the space. But all the time I was perfecting my plan of what I really wanted in a kitchen, and how to fit it into what seemed a huge area. As you can see it was a bit of a jumble at times. Sorting out what to put in our kitchen in waiting. 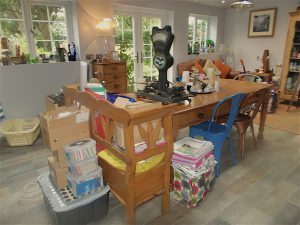 The kitchen was to be fitted in mid-September, 2016, so at the end of July, and although we had enjoyed living in it for almost a year, we decided we ought to make a start on emptying our large room. Our first appliance, a Bosch Dishwasher, was delivered (see Bottom right). 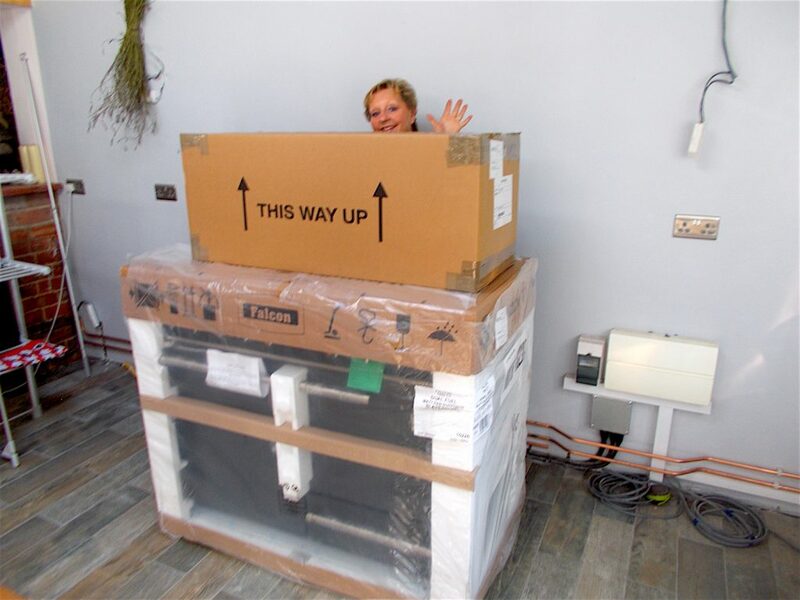 All the pipework and electrics had been fitted some months ago, as you can see, but the next appliances to arrive were the huge Fisher Paykel fridge-freezer, and on the 31st August, 2016 I took delivery of my Falcon range-cooker (see below). Some of you may know that I grew up with an old AGA in my parents’ house which belched fumes out, but kept us warm. Years later I had a fun two years working for AGA, in their Beverley shop, and 22 years ago, before I moved to Hessle, I was able to buy a huge, British Racing Green 4-oven AGA cooker, using my staff discount. How I loved my AGA, but we had to leave it in Hessle, and, believe me, in 22 years the price has gone up considerably – it had almost trebled in price! So my choice was between having an AGA, and only half a fitted kitchen, or buying a more reasonable cooker and getting the full fitted kitchen. No choice then. A Falcon cooker was chosen. Oh, and a Siemens built-in oven with a microwave function for Erik. Bella & Tilly enjoying nibbles in the midst of chaos. Early September 2016, I had a special birthday, a very ‘big’ birthday. Designer Son, Anthony, wife Amelia and their Twins, Bella and Tilly, came to take us out for my special day, and stayed the night. 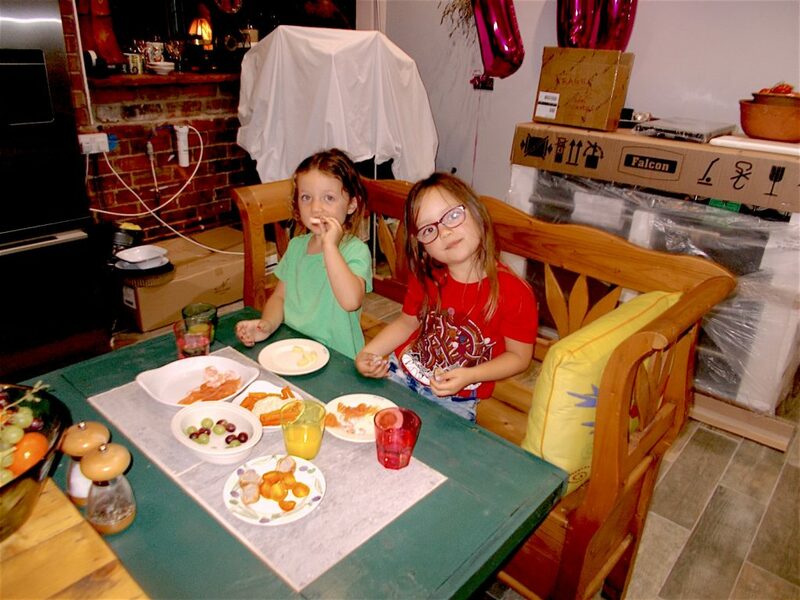 The next morning we had fun eating in the chaotic room that was to be our kitchen, and the Twins enjoyed it too. I believe it was Hummus, smoked salmon, grapes and bread and butter – not quite Michelin star, but they ate it all up, bless them. 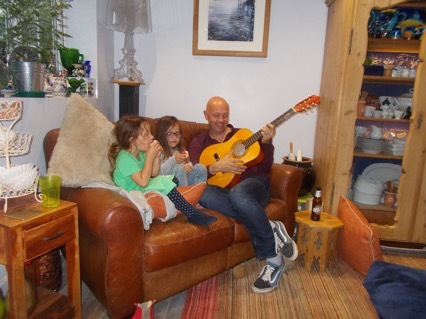 And below, one of my favourite pictures of a relaxed Anthony discovering his musical talents whilst entertaining his twins. Ant & Twins enjoying some music. Mid September 2016, my dream kitchen begins to take shape. The fitter from the Kingston Kitchen & Bedroom Company, Keith, arrives, and works so efficiently and fast – I even had to persuade him to stop and have a drink every so often. 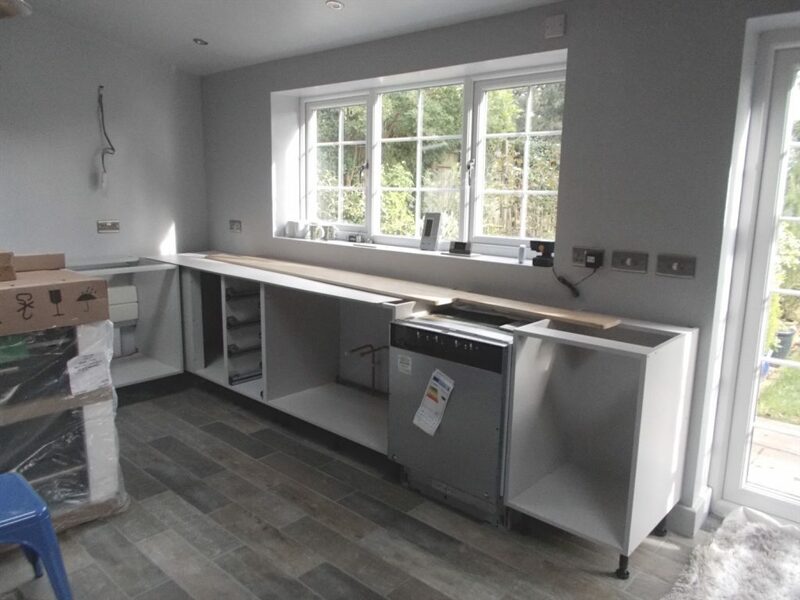 As he worked on fitting the units at our house, the Kitchen company had their own specialist joiners finishing off the units for Keith to fit the next day. Start of the fitted kitchen. If I remember correctly, Keith fitted this run of units above on the first day. I couldn’t believe it was like my dream actually coming true in front of me. It was almost like Christmas – me peeking into the units as Keith carried them in from his car every morning, and then, hey presto, by lunchtime another run of units had been fitted. 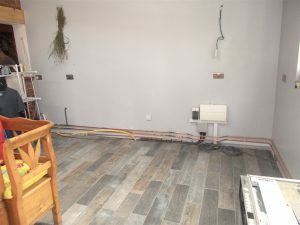 Every day I took some photos, some good, some not so good, but I had waited so long for my dream kitchen that it seemed a good idea to record it’s progress. A bit more kitchen every day. 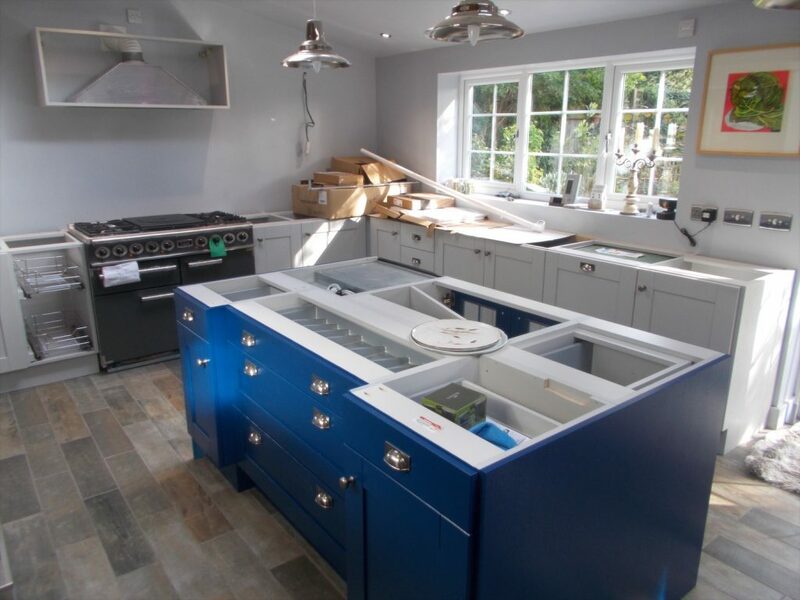 The next items fitted were the Falcon range cooker, the extractor fan above it, and the start of the Island units. I breathed a big sigh of relief when I realised that I had given us plenty of room around the Island to work at the sink, cook at the cooker and open the large doors of the fridge-freezer easily. Although I had spent hours working out all the measurements, I knew my own strengths and weaknesses, and so I asked Mike O’Malley, who owned the kitchen company, to double check my measurements before he did anything, and, would you believe it, I had measured it all correctly. Thank goodness – my Dad would have been proud of me. Cooker and Island in. Wow! Putting the shelves in for my two big cupboards either side of the range cooker was the next step. I decided that I wanted to put my electrical appliances on the worktop inside cupboards, so we had double sockets fitted on the walls, so that I could just open the doors, slide my heavy food mixer out a little and use it, without having to lift such a heavy object up into the worktop. We also had the wall tiled up to the first shelf, so it was easy to clean. I love the folding doors as well (see picture lower down). And what do you think of my chopping block? 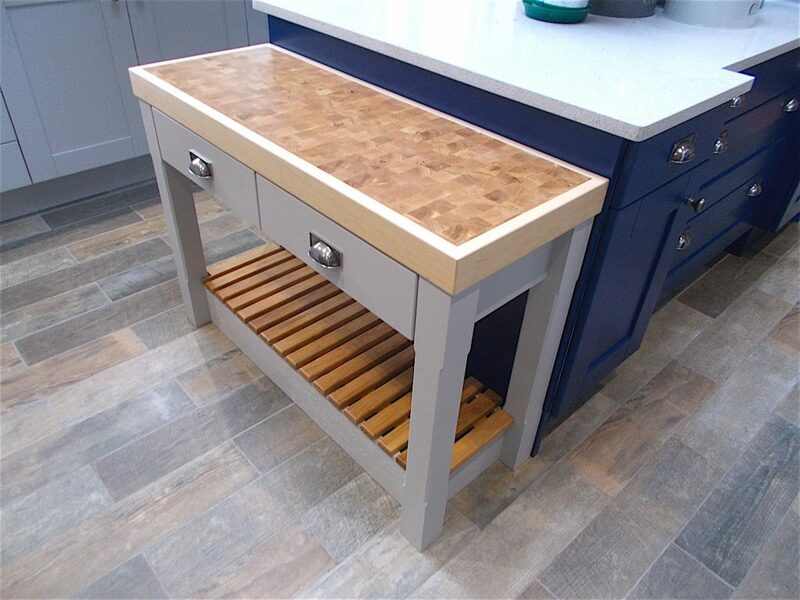 I had seen what I wanted on line – an end-grain chopping block, surrounded by a Maple frame, and underneath a slatted shelf which I could take up and sweep the bits out every so often. I just wanted a warm, wooden unit in the midst of all the silver grey walls and units. I couldn’t believe how fantastic it looked, opposite the cooker. And it was a bit lower than the majority of the worktops, so perfect for me (at only 5ft 3 inches) for such as beating Yorkshire Pudding batter etc. But when I first saw this beautiful piece of woodwork, I was taken aback. It was almost too fantastic to chop and slice on. When I mentioned that to the kitchen fitter, Keith, he laughed. He told me that the man who had worked on placing all those pieces of end-grain blocks together had showed his finished masterpiece to his workmates, and they all agreed is was too nice to ruin with a cleaver. So they made me a wonderful thick rectangular chopping board, to chop and slice away to my heart’s content, to have on top of the amazing butcher’s block. And it was a wonderful present, bless them. Amazing butcher’s block – just love it. 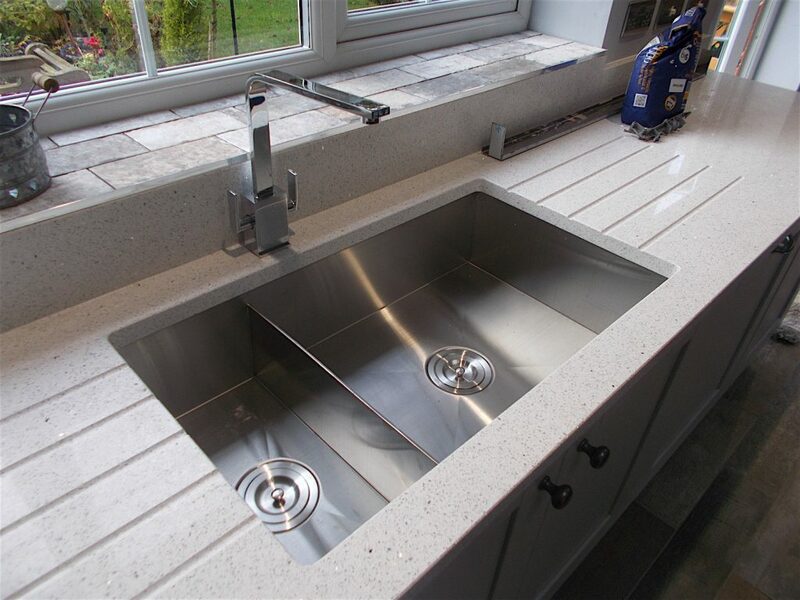 Below is our amazingly beautiful stainless steel sink. We searched around for a double sink, and, because I had been lucky enough to have had an AGA for years, I still had a lot of the big roasting tins and oven trays, so needed a biggish sink to wash them in. After quite a lot of searching, I showed Erik a picture of this one, which was from the fitted kitchen company, Neptune. We had a sortie to see it for real, at one of their many branches. We went towards York, then at the Grimston Bar roundabout turned to the right, towards Scarborough on the A 64 road, and only a few miles along found the stunning Neptune showrooms. One look at the sink convinced us it was just what we needed. And here it is. 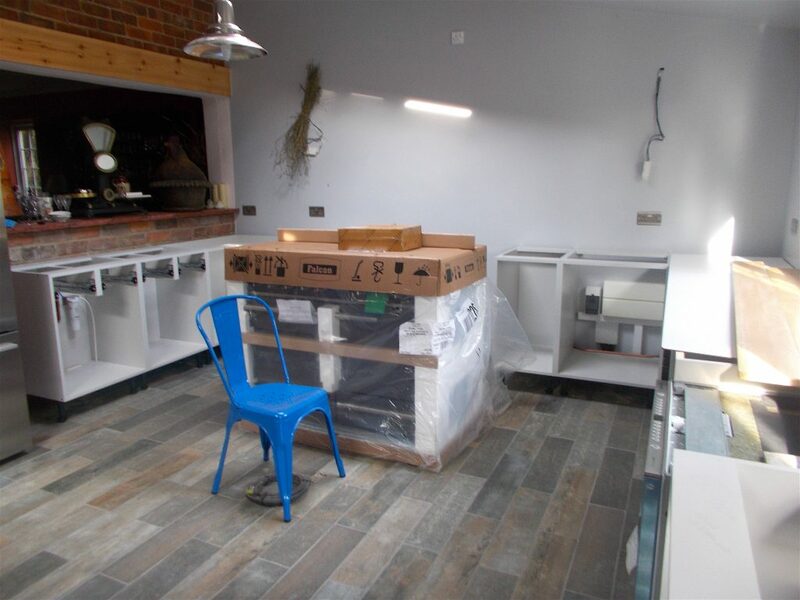 Well, nearly three weeks had passed and our kitchen was almost ready. The cupboard doors were fitted, as were some fantastic units either side of our big fridge-freezer. 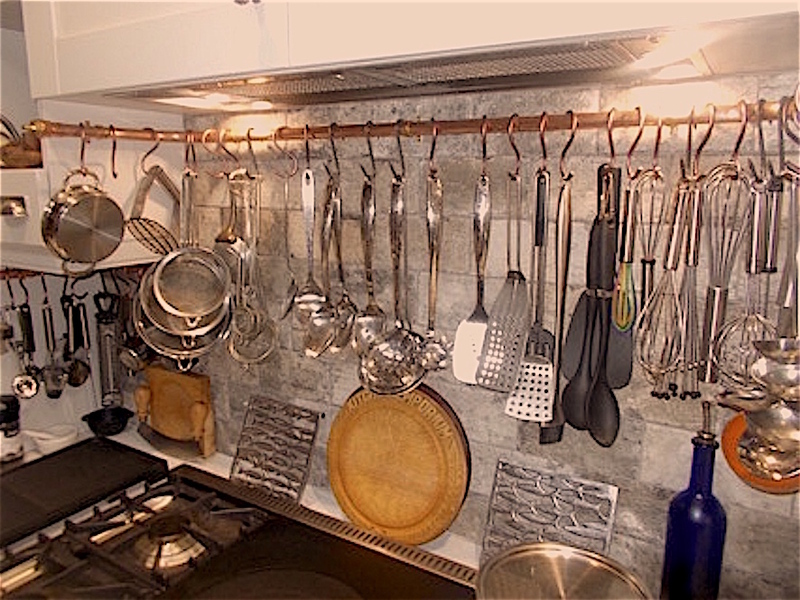 Six-foot tall, pull-out metal food racks, one his and one hers, so that Erik had all his favourite foodie seasonings, sauces, etc. to cook his choice of spicy Mexican, Thai, Indian foods, and mine was very quickly full of flavourings and tins for me to make my favourite English, Italian, French, Greek and Moroccan recipes. I insisted on these two units, as I generally put things away in the same place, whereas Erik is not – how shall I put it – quite as tidy as I am. But even he admits that he enjoys having his own food cupboard. And now for the fun bit. We had to get a new plumber, and one highly recommended by some friends in Bridlington. I had loved the copper water pipes put in our extension, around the walls, and suddenly wondered if they would be strong enough for all our utensils around the range-cooker. Our young plumber was incredibly inventive, and loved the idea, so after we explained what we wanted, and showed him how many utensils we had collected over the years, he said he would rifle through his tool kit and see what he could come up with. So here it is, our Steam-Punk Batterie de Cuisine, put together using copper piping and brass screws and end pieces. We just love it, and don’t care if it discolours gradually, with grease, heat and age. Our Steam-Punk Batterie de Cuisine. My dream kitchen was finished by early October 2016. Well, to be honest, there was still one thing I had set my heart on, but it had to wait until July this year (2017). 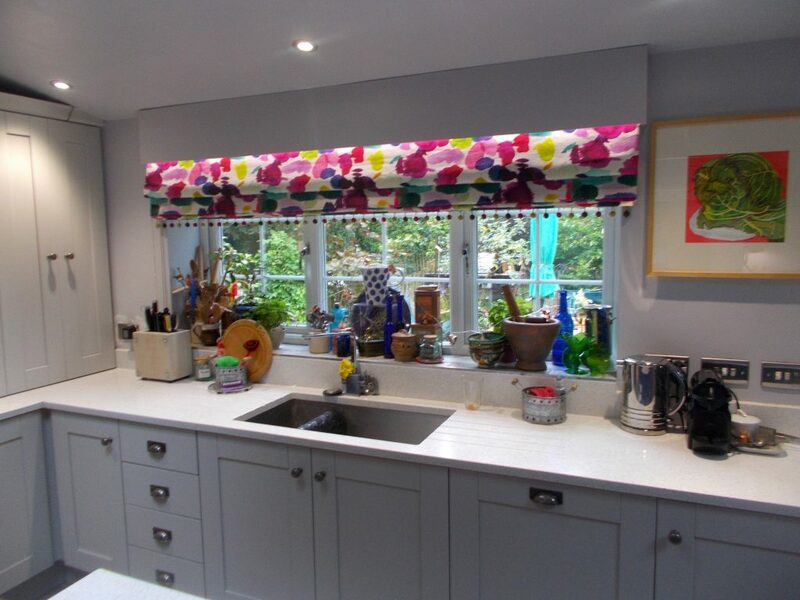 I had really fallen in love with a fabric by Bluebell Gray, and, because there was a lot of silver-grey in the kitchen, plus a small amount of what I call “Santorini Blue”, I wanted fabric blinds overflowing with colour. The Bluebell Grey “Abstract” ticked all the right boxes, except we had spent our budget on the kitchen fittings. Not to be deterred, Erik and myself visited our favourite curtain maker, Janet Edson, at her curtain and fabric shop in Beverley, and asked her if she was a stockist for Bluebell Gray, but her answer was ‘”No”. Luckily I had taken along my Bluebell Gray fabric samples, and Janet and her staff loved them, and immediately contacted the company with a view to stocking their fabrics. We were honest with Janet, who had been making our curtains for many years, and explained that we had to save up for these blinds, and it would be July 2017 before we could afford them, but Janet came out to measure up, and we said we would give them a ring as soon as the time was right. So July 2017 resulted in the finishing touch for my dream kitchen. See what you think. The finishing touch – our blinds. Michael O’Malley, Kingston Kitchen & Bedroom Company Showroom, 56-60 Alfred Street, Hull, HU3 2DF. 6 Responses to My Dream Kitchen – At Last. Wow this is fantastic. You and Erik have done well. It looks so different from what i saw of the place when i was there. I will have to make another trip to see it. Well done to you both. What a wonderful project! Love every thing about it. You may not know but Debbie and I are building a kitchen as well. We hope to finish in the spring. We hope it hope it will be our dream Kitchen also because it will surely be our last as we are retiring in December. Really enjoy your blog! Hi Marc, Astrid here. (Erik is still in bed, just about to wake him up!) So glad you liked the Kitchen. Just wish I had done this a few years ago, but I guess it’s never too late to have some fun. Hope your kitchen is finished in Spring, and you enjoy it as much as Erik and I do. Just need all my tastebuds back to normal after my Chemo treatment now, and I’ll be raring to go again, cooking and blog wise. It is difficult writing recipes when you can’t quite taste the food properly, but getting better now. Lovely to talk to you, and keep reading. If you ever fancy a trip, we have a very cosy smallish house, near the North Sea coast in East Yorkshire, with a fluffy dog and, as you can see, a big kitchen. Enjoy your retirement. Love Astrid. What a great project and realisation of a dream. I bet you’re cooking up a storm now. You lucky lucky people having such a kitchen to create in. Looking forward to your spring recipes.